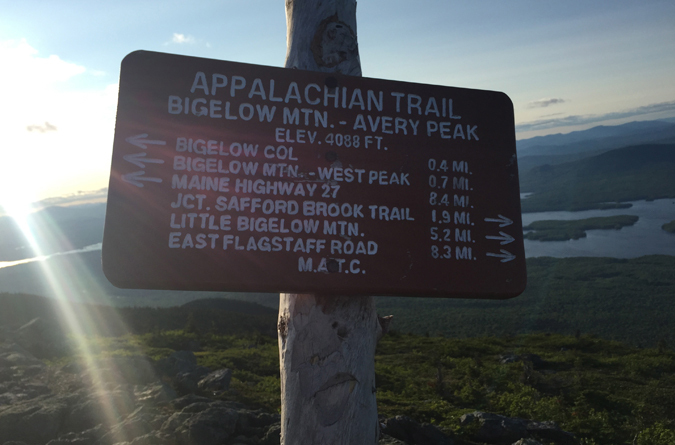 A day hike to Bigelow Mountain’s Avery Peak and West Peak via the Fire Warden Trail, possibly in conjunction with the Appalachian Trail and the Horns Pond Trail as a loop hike, is a sure-bet treasured experience for the memory bank. But before you deposit this trek, ask yourself, why day hike the Fire Warden Trail when you can spend a wicked awesome evening in the Bigelow Col at the Myron H. Avery Memorial Campsite? Ka-ching! This adventure begins at the parking lot on the Stratton Brook Pond Road, which is accessed from U.S. Route 27. If you’re driving toward Stratton and Eustis on 27, the Stratton Brook Pond Road is on the right shortly after the Appalachian Trail parking lot. The Stratton Brook Pond Road also crosses the Appalachian Trail, and there’s often cars parked near the trailhead, so don’t be fooled into stopping here. On the map, the Stratton Brook Pond Road officially ends at the parking area for the Fire Warden and Horns Pond trails, but in reality a slightly slimmer version of this dirt road continues another 0.4 mile to the Stratton Brook Pond outlet. Four-wheel drive vehicles could continue on the road, and if you decide to take this shortcut, please do the rest of us a favor and feel adequately ashamed of yourself. After all, we won’t judge. The footbridge crossing the Stratton Brook Pond outlet marks the point where vehicles must be left behind. On bluebird days the footbridge is worth a pause to admire the views of Bigelow’s South Horn. The pond side of the bridge provides a glimpse of Sugarloaf Mountain. After the bridge, the next 0.7 mile of the trail is more akin to a nature walk than a hike; the going is flat and smooth. It’s also worth noting that there are a couple of designated campsites here, one just after the bridge and the other a little further up the trail. These campsites are a great option for hikers traveling long distances to reach the mountain—arrive in the early evening, camp out, and attack Bigelow first-thing in the morning. The sites were in great shape, and there wasn’t any sign of it being a teenager hangout for drinking (sometimes an issue with sites easily accessible from the road). The easy stretch of trail after the footbridge. One of the authorized campsites near the beginning of the trail. The initial campsite even had a privy. If you’re looking for a hike to do after an evening of eating buffalo wings, this is it. In total it’s a three-privy hike. As the trail turns away from the pond, there’s a sneak peak of Bigelow’s West Peak and Avery Peak. Shortly after leaving the pond area the trail reaches the old “official” trailhead, where the first sign outlining the mile markers is present. The sign indicates that it’s 1.4 miles to where the Horns Pond Trail diverges from the Fire Warden Trail, but the Appalachian Trail in Maine map cites this as 1.2. Either way, the 0.2 in question won’t matter because the trail gradually climbs the mountain from here, broken up by one moderately steep ridge with a slight rock scramble. Once atop the ridge, the trail dips for a bit and returns to a somewhat flat, somewhat gentle ascent. The rocky climb over the initial ridge. From the Horns Pond/Fire Warden intersection, it’s one mile to the Moose Falls Campsite. Most of this is a continued diagonal climb up the mountain, but the last bit before the campsite features a steep switchback with rock staircases—consider this foreshadowing for the final ascent. If the weather isn’t supporting camping near the top of the mountain at the Avery Memorial site, Moose Falls offers a good alternative. It was a little disappointing for us, because after geeking my son up over the possibility of seeing a waterfall, the falls wasn’t more than a small stream. Perhaps there’s more to it in the spring. It’s also worth noting that the Fire Warden Trail crosses the same stream just above the campsite, so if you need water and you’re not camping here, it’s best to continue on than to take the side trail. The immediate climb from the Moose Falls Campsite. Out of the Moose Falls Campsite the Fire Warden Trail climbs over a rock outcropping entangled in roots, before once again settling into a diagonal climb. This time the easy going is short lived. The last 0.7 mile to Bigelow Col is where you earn Bigelow’s beautiful views by conquering a steep, tightly spiraled staircase that gains 1,300 feet in elevation. You simply can’t climb a 4K mountain without some steep climbs. It just so happens that the Fire Warden Trail saves almost all of them for the bitter end. 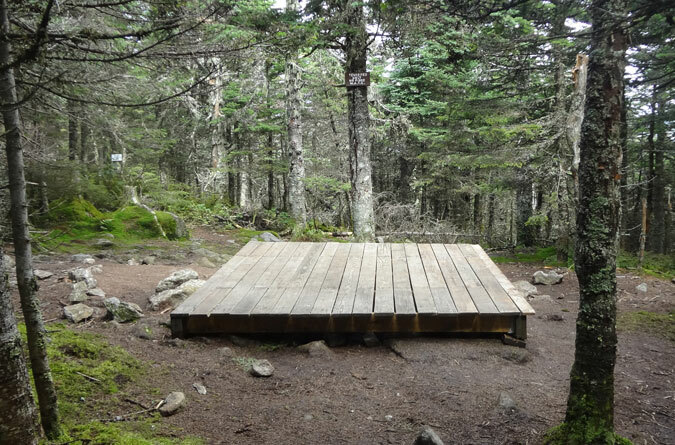 Reached around 3,800 feet, the Avery Memorial Campsite honors Myron H. Avery, the Appalachian Trail visionary who saw to it that the trail extend through Maine to Katahdin. For more on Bigelow’s history, see our Hike the Bigelow Mountain Range via the Appalachian Trail article. As for the campsite, it contains several tent platforms along with a group tenting area, a privy, and a caretaker cabin that is typically locked up. Some of the tent platforms offer views of Avery Peak, as well as obstructed views toward Sugarloaf. Water is had through a small spring that’s covered with a half box (another small spring is available on the Appalachian Trail hike to Avery Peak). The view of Avery Peak from the Avery Memorial Campsite. The group tenting area at the Avery Memorial Campsite. The best part of camping at Avery is that it’s right smack in the middle of the col between Bigelow’s Avery Peak and West Peak, which makes it easy to enjoy a sunset or sunrise (or both) from one of these great summits. While the distances to each are short (0.4 to Avery and 0.3 to West), the Appalachian Trail is rocky and tricky here, so I didn’t want to push my luck with taking a six year old out in the dark. My son and I settled on visiting Avery Peak shorty before sunset. The way he gasped and said “Wow” as we broke treeline and looked upon Flagstaff Lake will forever enrich my memory bank. Looking down upon Flagstaff Lake from Avery Peak. The summit sign atop Avery Peak. The foundation to the old fire lookout cabin on Avery Peak. The West Peak was silhouetted as sunset drew near.